Wayland is a computer protocol that specifies the communication between a display server and its clients, as well as a reference implementation of the protocol in the C programming language. A display server using the Wayland protocol is called a Wayland compositor. Wayland is developed by a group of volunteers initially led by Kristian Høgsberg as a free and open community-driven project with the aim of replacing the X Window System with a modern, simpler windowing system in Linux and other Unix-like operating systems. The project's source code is published under the terms of the MIT License, a permissive free software licence. As part of its efforts, the Wayland project also develops a reference implementation of a Wayland compositor called Weston. The evdev module of the Linux kernel gets an event and sends it to the Wayland compositor. The Wayland compositor looks through its scenegraph to determine which window should receive the event. The scenegraph corresponds to what is on screen and the Wayland compositor understands the transformations that it may have applied to the elements in the scenegraph. Thus, the Wayland compositor can pick the right window and transform the screen coordinates to window local coordinates, by applying the inverse transformations. The types of transformation that can be applied to a window is only restricted to what the compositor can do, as long as it can compute the inverse transformation for the input events. As in the X case, when the client receives the event, it updates the UI in response. But in the Wayland case, the rendering happens by the client via EGL, and the client just sends a request to the compositor to indicate the region that was updated. The Wayland compositor collects damage requests from its clients and then re-composites the screen. The compositor can then directly issue an ioctl to schedule a pageflip with KMS. In recent years,[when?] Linux desktop graphics has moved from having "a pile of rendering interfaces... all talking to the X server, which is at the center of the universe" towards putting the Linux kernel and its components (i.e. Direct Rendering Infrastructure (DRI), Direct Rendering Manager (DRM)) "in the middle", with "window systems like X and Wayland ... off in the corner". This will be "a much-simplified graphics system offering more flexibility and better performance". What’s different now is that a lot of infrastructure has moved from the X server into the kernel (memory management, command scheduling, mode setting) or libraries (cairo, pixman, freetype, fontconfig, pango, etc. ), and there is very little left that has to happen in a central server process. ... [An X server has] a tremendous amount of functionality that you must support to claim to speak the X protocol, yet nobody will ever use this. ... This includes code tables, glyph rasterization and caching, XLFDs (seriously, XLFDs! ), and the entire core rendering API that lets you draw stippled lines, polygons, wide arcs and many more state-of-the-1980s style graphics primitives. For many things we've been able to keep the X.org server modern by adding extension such as XRandR, XRender and COMPOSITE ... With Wayland we can move the X server and all its legacy technology to an optional code path. Getting to a point where the X server is a compatibility option instead of the core rendering system will take a while, but we'll never get there if [we] don’t plan for it. Wayland consists of a protocol and a reference implementation named Weston. The project is also developing versions of GTK+ and Qt that render to Wayland instead of to X. Most applications are expected to gain support for Wayland through one of these libraries without modification to the application. Initial versions of Wayland have not provided network transparency, though Høgsberg noted in 2010 that network transparency is possible. It was attempted as a Google Summer of Code project in 2011, but was not successful. Adam Jackson has envisioned providing remote access to a Wayland application by either "pixel-scraping" (like VNC) or getting it to send a "rendering command stream" across the network (as in RDP, SPICE or X11). As of early 2013, Høgsberg is experimenting with network transparency using a proxy Wayland server which sends compressed images to the real compositor. In August 2017, GNOME saw the first such pixel-scraping VNC server implementation under Wayland. In the Wayland protocol architecture, a client and a compositor communicate through the Wayland protocol using the reference implementation libraries. Wayland protocol follows a client–server model in which clients are the graphical applications requesting the display of pixel buffers on the screen, and the server (compositor) is the service provider controlling the display of these buffers. While the low-level layer was written manually in C, the high-level layer is automatically generated from a description of the elements of the protocol stored in XML format. Every time the protocol description of this XML file changes, the C source code that implements such protocol can be regenerated to include the new changes, allowing a very flexible, extensible and error-proof protocol. The Wayland protocol is described as an "asynchronous object-oriented protocol". :9 Object-oriented means that the services offered by the compositor are presented as a series of objects living on the same compositor. Each object implements an interface which has a name, a number of methods (called requests) as well as several associated events. Every request and event has zero or more arguments, each one with a name and a data type. The protocol is asynchronous in the sense that requests do not have to wait for synchronized replies or ACKs, avoiding round-trip delay time and achieving improved performance. For a client to be able to make a request to an object, it first needs to tell the server the ID number it will use to identify that object. :9 There are two types of objects in the compositor: global objects and non-global objects. Global objects are advertised by the compositor to the clients when they are created (and also when they are destroyed), while non-global objects are usually created by other objects that already exist as part of their functionality. The interfaces of the current version of Wayland protocol are defined in the file protocol/wayland.xml of the Wayland source code. This is an XML file that lists the existing interfaces in the current version, along with their requests, events and other attributes. This set of interfaces is the minimum required to be implemented by any Wayland compositor. 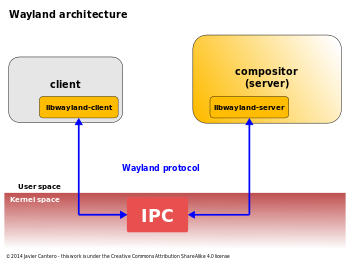 A typical Wayland client session starts by opening a connection to the compositor using the wl_display object. This is a special local object that represents the connection and does not live within the server. By using its interface the client can request the wl_registry global object from the compositor, where all the global object names live, and bind those that the client is interested in. Usually the client binds at least a wl_compositor object from where it will request one or more wl_surface objects to show the application output on the display. A Wayland compositor can define and export its own additional interfaces. :10 This feature is used to extend the protocol beyond the basic functionality provided by the core interfaces, and has become the standard way to implement Wayland protocol extensions. Certain compositors can choose to add custom interfaces to provide specialized or unique features. The Wayland reference compositor, Weston, used them to implement new experimental interfaces as a testbed for new concepts and ideas, some of which later became part of the core protocol (such as wl_subsurface interface added in Wayland 1.4). XDG-Shell protocol (see freedesktop.org for XDG) is an extended way to manage surfaces under Wayland compositors (not only Weston). The traditional way to manipulate (maximize, minimize, fullscreen, etc.) surfaces is to use the wl_shell_*() functions, which are part of the core Wayland protocol and live in libwayland-client. An implementation of the xdg-shell protocol, on the contrary, is supposed to be provided by the Wayland compositor. So you will find the xdg-shell-client-protocol.h header in the Weston source tree. Each Wayland compositor is supposed to provide its own implementation. As of June 2014[update], XDG-Shell protocol was not versioned and still prone to changes. xdg_shell is a protocol aimed to substitute wl_shell in the long term, but will not be part of the Wayland core protocol. It starts as a non-stable API, aimed to be used as a development place at first, and once features are defined as required by several desktop shells, it can be finally made stable. It provides mainly two new interfaces: xdg_surface and xdg_popup. The xdg_surface interface implements a desktop-style window that can be moved, resized, maximized, etc. ; it provides a request for creating child/parent relationship. The xdg_popup interface implements a desktop-style popup/menu; an xdg_popup is always transient for another surface, and also has implicit grab. IVI-Shell is an extension to the Wayland core protocol, targeting in-vehicle infotainment (IVI) devices. 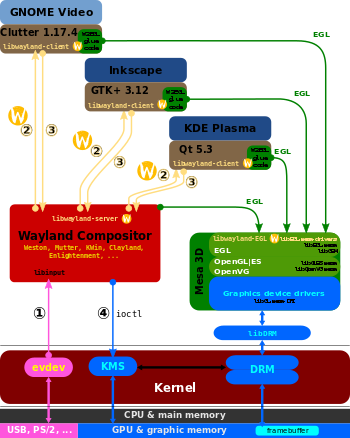 Wayland compositor and its clients use EGL to draw directly into the framebuffer; X.Org Server with XWayland and Glamor. The Wayland protocol does not include a rendering API. :7:2 Instead, Wayland follows a direct rendering model, in which the client must render the window contents to a buffer shareable with the compositor. :7 For that purpose, the client can choose to do all the rendering by itself, use a rendering library like Cairo or OpenGL, or rely on the rendering engine of high-level widget libraries with Wayland support, such as Qt or GTK+. The client can also optionally use other specialized libraries to perform specific tasks, such as Freetype for font rendering. The resulting buffer with the rendered window contents are stored in a wl_buffer object. The internal type of this object is implementation dependent. The only requirement is that the content data must be shareable between the client and the compositor. If the client uses a software (CPU) renderer and the result is stored in the system memory, then client and compositor can use shared memory to implement the buffer communication without extra copies. The Wayland protocol already natively provides this kind of shared memory buffer through the wl_shm and wl_shm_pool interfaces. :11, 20-21 The drawback of this method is that the compositor may need to do additional work (usually to copy the shared data to the GPU) to display it, which leads to slower graphics performance. The most typical case is for the client to render directly into a video memory buffer using a hardware (GPU) accelerated API such as OpenGL, OpenGL ES or Vulkan. Client and compositor can share this GPU-space buffer using a special handler to reference it. This method allows the compositor to avoid additional copies of data to the GPU, resulting in faster graphics performance than using shm buffers, and is therefore the preferred one. The compositor can further optimize the composition of the final scene to be shown on the display by using the same hardware acceleration API as the client. The composition manager is a separate, additional feature in X, while Wayland merges display server and compositor as a single function. Also, it incorporates some of the tasks of the window manager, which in X is a separate client-side process. The X server itself is able to perform rendering, although it can also be instructed to display a rendered window sent by a client. In contrast, Wayland does not expose any API for rendering, but delegates to clients such tasks (including the rendering of fonts, widgets, etc.). Window decorations can be rendered on the client side (e.g., by a graphics toolkit) or on the server side (by the compositor). Wayland isolates the input and output of every window, achieving confidentiality, integrity and availability in both cases; the original X design lacks these important security features, although some extensions have been developed trying to mitigate it. Also, with the vast majority of the code running in the client, less code needs to run with root privileges, improving security, although multiple popular Linux distributions now allow X to be run without root privileges. The X server provides a basic communication method between X clients, later extended by ICCCM conventions. This X client-to-client communication is used by window managers and also to implement X sessions, selections and drag-and-drop, and other features. The Wayland core protocol does not support communication between wayland clients at all, and the corresponding functionality (if needed) should be implemented by the desktop environments (like KDE or GNOME), or by a third party (for example, by using native IPC of the underlying operating system). The X Window System is an architecture that was designed at its core to run over a network. Wayland does not offer network transparency by itself; however, a compositor can implement any remote desktop protocol to achieve remote display. In addition, there is research into Wayland image streaming and compression that would provide remote frame buffer access similar to that of VNC. XWayland is an X Server running as a Wayland client, and thus is capable of displaying native X11 client applications in a Wayland compositor environment. This is similar to the way XQuartz runs X applications in macOS’s native windowing system. The goal of XWayland is to facilitate the transition from X Window System to Wayland environments, providing a way to run unported applications in the meantime. XWayland was mainlined into X.Org Server version 1.16. Widget toolkits such as Qt 5 and GTK+ 3 can switch their graphical back-end at run time, allowing users to choose at load time whether they want to run the application over X or over Wayland. Qt 5 provides the -platform command-line option to that effect, whereas GTK+ 3 lets users select the desired GDK back-end by setting the GDK_BACKEND Unix environment variable. Typical elements of a window. Neither Wayland nor X11 specifies what software is responsible for rendering the window decoration. Weston requires that they are drawn by the client, but KWin will implement server-side decoration. Display servers that implement the Wayland display server protocol are also called Wayland compositors because they additionally perform the task of a compositing window manager. Lipstick – mobile graphical shell framework which implements Wayland compositor. It is used in Sailfish OS, Nemo Mobile and AsteroidOS. Enlightenment has full Wayland support since version 0.20. KWin has nearly complete Wayland support as of 2018. Mutter maintains a separate branch for the integration of Wayland for GNOME 3.9 (in September 2013). Clayland is a simple example Wayland compositor using Clutter. Westeros is a Wayland compositor library that allows applications to create their own Wayland displays, which allows nesting and embedding of third party applications. Sway - Sway is a tiling Wayland compositor and a drop-in replacement for the i3 window manager for X11. Weston is the reference implementation of a Wayland compositor also developed by the Wayland project. It is written in C and published under the MIT License. Weston only has official support for the Linux operating system due to its dependence on certain features of the Linux kernel, such as kernel mode-setting, Graphics Execution Manager (GEM), and udev, which have not been implemented in other Unix-like operating systems. When running on Linux, handling of the input hardware relies on evdev, while the handling of buffers relies on Generic Buffer Management (GBM). However, in 2013 a prototype port of Weston to FreeBSD was announced. Weston relies on GEM to share application buffers between the compositor and applications. It contains a plug-in system of "shells" for common desktop features like docks and panels. Clients are responsible for the drawing of their window borders and their decorations. For rendering, Weston can use OpenGL ES or the pixman library to do software rendering. The full OpenGL implementation is not used, because on most current systems, installing the full OpenGL libraries would also install GLX and other X Window System support libraries as dependencies. Maynard is a graphical shell and has been written as a plug-in for Weston, just as the GNOME Shell has been written as a plug-in to Mutter. A remote access interface for Weston was proposed in October 2013 by a RealVNC employee. libinput was created to consolidate the input stack across multiple Wayland compositors. Libinput handles input devices for multiple Wayland compositors and also provides a generic X.Org Server input driver. It aims to provide one implementation for multiple Wayland compositors with a common way to handle input events while minimizing the amount of custom input code compositors need to include. libinput provides device detection[clarification needed] (via udev), device handling, input device event processing and abstraction. Version 1.0 of libinput followed version 0.21, and included support for tablets, button sets and touchpad gestures. This version will maintain stable API/ABI. As GNOME/GTK+ and KDE Frameworks 5 have mainlined the required changes, Fedora 22 will replace X.Org's evdev and Synaptics drivers with libinput. The Weston code for handling input devices (keyboards, pointers, touch screens, etc.) was split into its own separate library, called libinput, for which support was first merged in Weston 1.5. With version 1.16, the X.Org Server obtained support for the libinput library in form of a wrapper called xf86-input-libinput. Wayland Security Module is a proposition that resembles the Linux Security Module interface found in the Linux kernel. Some applications (especially the ones related to accessibility) require privileged capabilities that should work across different Wayland compositors. Currently,[when?] applications under Wayland are generally unable to perform any sensitive tasks such as taking screenshots or injecting input events. Wayland developers are actively looking for feasible ways to handle privileged clients securely and then designing privileged interfaces for them. Wayland Security Module is a way to delegate security decisions within the compositor to a centralized security decision engine. The Wayland protocol is designed to be simple so that additional protocols and interfaces need to be defined and implemented to achieve a holistic windowing system. As of July 2014 these additional interfaces were being worked on. So, while the toolkits already fully support Wayland, the developers of the graphical shells are cooperating with the Wayland developers creating the necessary additional interfaces. Fedora starting with version 25 uses Wayland for the default GNOME 3.22 desktop session, with X.Org as a fallback if the graphics driver cannot support Wayland. RebeccaBlackOS is a live USB Debian-based Linux distribution that allows a convenient way to try out a real Wayland desktop without having to make any modifications to the main operating system of the computer. It is being used since as early as 2012 to showcase Wayland. Ubuntu ships Wayland as default in Ubuntu 17.10 (Artful Aardvark). Ubuntu reverted to X.Org for Ubuntu 18.04 LTS, as Wayland still has issues with screen sharing and remote desktop applications, and does not recover as well from window manager crashes. Clutter has complete Wayland support. EFL has complete Wayland support, except for selection. GTK+ 3.20 has complete Wayland support. Qt 5 has complete Wayland support, and can be used to write both Wayland compositors and Wayland clients. SDL support for Wayland debuted with the 2.0.2 release and was enabled by default since version 2.0.4. GLFW 3.2 has Wayland support. FreeGLUT has initial Wayland support. Desktop environments in process of being ported from X to Wayland include GNOME, KDE Plasma 5 and Enlightenment. In November 2015, Enlightenment e20 was announced with full Wayland support. GNOME 3.20 was the first version to have a full Wayland session. GNOME 3.22 now defaults to Wayland. GNOME 3.24 will ship the NVidia patches developed for Fedora 25. Wayland support for KDE Plasma was delayed until the release of Plasma 5, though previously KWin 4.11 got an experimental Wayland support. The version 5.4 of Plasma was the first with a Wayland session. Intelligent Input Bus is working on Wayland support, it could be ready for Fedora 22. RealVNC published a Wayland developer preview in July 2014. Maliit is an input method framework that runs under Wayland. kmscon supports Wayland with wlterm. Mesa has Wayland support integrated. Eclipse was made to run on Wayland during a GSoC-Project in 2014. The Vulkan WSI (Window System Interface) is a set of API calls serve a similar purpose as EGL does for OpenGL ES or GLX for OpenGL. Vulkan WSI includes support for Wayland from day one: VK_USE_PLATFORM_WAYLAND_KHR. Vulkan clients can run on unmodified Wayland servers, including Weston, GENIVI LayerManager, Mutter / GNOME Shell, Enlightenment, and more. The WSI allows applications to discover the different GPUs on the system, and display the results of GPU rendering to a window system. GENIVI Alliance: The GENIVI automotive industry consortium for in-vehicle infotainment (IVI) supports Wayland. Raspberry Pi: The Raspberry Pi Foundation in collaboration with Collabora released Maynard and work on improving performance and memory consumption, but do not expect to be able to replace X11 as the default display server until later in 2013. Jolla: Smartphones from Jolla use Wayland. It is also used as standard when Linux Sailfish OS is used with hardware from other vendors or when it is installed into Android devices by users. Tizen: Tizen up to 2.x supports Wayland in in-vehicle infotainment (IVI) setups and from 3.0 onward defaults to Wayland. Wayland uses direct rendering over EGL. Kristian Høgsberg, a Linux graphics and X.Org developer who previously worked on AIGLX and DRI2, started Wayland as a spare-time project in 2008 while working for Red Hat. His stated goal was a system in which "every frame is perfect, by which I mean that applications will be able to control the rendering enough that we'll never see tearing, lag, redrawing or flicker." Høgsberg was driving through the town of Wayland, Massachusetts when the underlying concepts "crystallized", hence the name. In October 2010, Wayland became a freedesktop.org project. As part of the migration the prior Google Group was replaced by the wayland-devel mailing list as the project's central point of discussion and development. The Wayland client and server libraries were initially released under the MIT License, while the reference compositor Weston and some example clients used the GNU General Public License version 2. Later all the GPL code was relicensed under the MIT license "to make it easier to move code between the reference implementation and the actual libraries". In 2015 it was discovered that the license text used by Wayland was a slightly different and older version of the MIT license, and the license text was updated to the current version used by the X.Org project (known as MIT Expat License). Wayland works with all Mesa-compatible drivers with DRI2 support as well as Android drivers via the Hybris project. The developers of Wayland are largely current X.Org Server developers. Old version, no longer supported: 1.5 20 May 2014 libinput. Fullscreen shell. Old version, no longer supported: 1.7 14 February 2015 Support for the Wayland presentation extension and for surface roles. IVI shell protocol. Old version, no longer supported: 1.8 2 June 2015 Separated headers for core and generated protocol Repaint scheduling. Named outputs. Output transformations. Surface-shooting API. Old version, no longer supported: 1.9 21 September 2015 Updated license Updated license. New test framework. Triple-head DRM compositor. linux_dmabuf extension. Old version, no longer supported: 1.12 21 September 2016 Debugging support improved libweston and libweston-desktop. Pointer locking and confinement. Relative pointer support. Old version, no longer supported: 1.13 24 February 2017 The ABI of Weston has been changed, thus the new version was named 2.0.0 rather than 1.13.0. Old version, no longer supported: 1.14 8 August 2017 Weston 3.0.0 was released at the same time. Old version, no longer supported: 1.15 9 April 2018 Weston 4.0.0 was released at the same time. Older version, yet still supported: 1.16 24 August 2018 Weston 5.0.0 was released at the same time. Current stable version: 1.17 20 March 2019 Weston 6.0.0 was released at the same time. ^ a b c Harrington, Bryce (15 September 2015). "[ANNOUNCE] wayland 1.8.93". freedesktop.org (Mailing list). ^ "wayland/wayland: root/COPYING". freedesktop.org. Retrieved 14 June 2015. ^ Larabel, Michael (10 June 2015). "Wayland's MIT License To Be Updated/Corrected". Phoronix.com. Retrieved 17 April 2016. ^ a b c "Wayland". Wayland project. Retrieved 9 May 2016. ^ a b c d "Wayland FAQ". Wayland project. Retrieved 9 May 2016. ^ Corbet, Jonathan (5 November 2010). "LPC: Life after X". LWN.net. Retrieved 17 April 2016. ^ Høgsberg, Kristian (9 November 2010). "Network transparency argument". Wayland isn't a remote rendering API like X, but that doesn't exclude network transparency. Clients render into a shared buffer and then have to tell the compositor (...) what they changed. The compositor can then send the new pixels in that region out over the network. The Wayland protocol is already violently asynchronous, so it should be able to handle a bit of network lag gracefully. Remote fullscreen video viewing or gaming isn't going to work well, [but] I don't know any other display system that handles that well and transparently. ^ Larabel, Michael (18 August 2011). "Remote Wayland Server Project: Does It Work Yet?". Phoronix.com. Retrieved 17 April 2016. ^ Jackson, Adam (9 November 2010). "[Re:] Ubuntu moving towards Wayland". ^ a b Stone, Daniel (28 January 2013). The real story behind Wayland and X (Speech). linux.conf.au 2013. Canberra. Retrieved 13 April 2016. ^ a b c Willis, Nathan (13 February 2013). "LCA: The ways of Wayland". LWN.net. Retrieved 19 May 2016. ^ Daniel Aleksandersen. "Remote desktop capabilities set to make a comeback in GNOME on Wayland". Ctrl.blog. Retrieved 29 August 2017. ^ a b "The Hello Wayland Tutorial". Retrieved 25 July 2014. ^ a b c d e f g h i j k l m n o Høgsberg, Kristian. "Wayland Documentation 1.3" (PDF). Retrieved 16 March 2016. ^ a b Høgsberg, Kristian. "protocol/wayland.xml". FreeDesktop.org. Retrieved 25 July 2014. ^ a b Paalanen, Pekka (25 July 2014). "Wayland protocol design: object lifespan". Retrieved 6 April 2016. ^ a b Høgsberg, Kristian (24 January 2014). "Wayland and Weston 1.4 is out". wayland-devel mailing list. ^ "xdg_shell: Adding a new shell protocol". freedesktop.org. 3 December 2013. Retrieved 14 June 2014. ^ a b c Vervloesem, Koen (15 February 2012). "FOSDEM: The Wayland display server". LWN.net. Retrieved 9 May 2016. ^ Paalanen, Pekka (21 November 2012). "On supporting Wayland GL clients and proprietary embedded platforms". Retrieved 6 April 2016. Buffer sharing works by creating a handle for a buffer, and passing that handle to another process which then uses the handle to make the GPU access again the same buffer. ^ Griffith, Eric (7 June 2013). "The Wayland Situation: Facts About X vs. Wayland". Phoronix.com. p. 2. Retrieved 17 April 2016. ^ a b "Wayland Architecture". Wayland project. Retrieved 9 May 2016. ^ Edge, Jake (11 April 2012). "LFCS 2012: X and Wayland". LWN.net. Retrieved 17 April 2016. ^ "Wayland/X Compositor Architecture By Example: Enlightenment DR19" (PDF). Retrieved 18 April 2016. ^ a b Graesslin, Martin (7 February 2013). 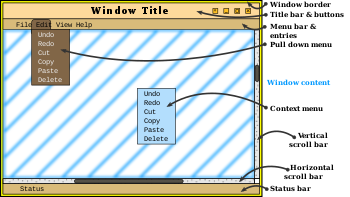 "Client Side Window Decorations and Wayland". Retrieved 17 April 2016. ^ a b Kerrisk, Michael (25 September 2012). "XDC2012: Graphics stack security". LWN.net. Retrieved 13 April 2016. ^ Peres, Martin (21 February 2014). "Wayland Compositors - Why and How to Handle Privileged Clients!". Retrieved 17 April 2016. ^ Graesslin, Martin (23 November 2015). "Looking at the security of Plasma/Wayland". Retrieved 18 April 2016. ^ "X.Org Security". X.Org Foundation. Retrieved 2 July 2017. The X server has long included an extension, SECURITY, which provides support for a simple trusted/untrusted connection model. ^ Wiggins, David P. (15 November 1996). "Security Extension Specification". X Consortium Standard. Retrieved 2 July 2017. ^ Walsh, Eamon F. (2009). "X Access Control Extension Specification". Retrieved 2 July 2017. ^ "X Clients under Wayland (XWayland)". Wayland project. Retrieved 18 July 2014. ^ "ANNOUNCE: xorg-server 1.16.0". freedesktop.org. 17 July 2014. ^ a b Høgsberg, Kristian (3 January 2011). "Multiple backends for GTK+". Retrieved 10 March 2016. ^ "QtWayland". Qt Wiki. Retrieved 9 March 2016. ^ "Full Wayland support in GTK+". GNOME wiki. Retrieved 10 March 2016. ^ Edge, Jake (31 July 2013). "Jolla: Sailfish OS, Qt, and open source". LWN.net. Retrieved 17 April 2016. ^ a b Larabel, Michael (30 November 2015). "Enlightenment 0.20 Arrives With Full Wayland Support & Better FreeBSD Support". Phoronix.com. Retrieved 17 April 2016. ^ "Westeros Github Mirror". Retrieved 19 September 2016. ^ "swaywm/wlroots". GitHub. Retrieved 28 October 2018. ^ "swaywm/sway". GitHub. Retrieved 28 October 2018. ^ "Sway". swaywm.org. Retrieved 20 December 2018. ^ "README file from the Wayland source code repository". freedesktop.org. ^ Larabel, Michael (16 February 2013). "Wayland Begins Porting Process To FreeBSD". Phoronix.com. Retrieved 17 April 2016. ^ Paalanen, Pekka (10 March 2012). "What does EGL do in the Wayland stack". Retrieved 19 May 2016. ^ a b Larabel, Michael (6 January 2013). "A Software-Based Pixman Renderer For Wayland's Weston". Phoronix.com. Retrieved 17 April 2016. ^ Høgsberg, Kristian (9 December 2010). "Blender3D & cursor clamping". ^ "Maynard announcement". 16 April 2014. Retrieved 16 April 2014. ^ a b "[RFC weston] remote access interface module". freedesktop.org. 18 October 2013. ^ "libinput". Freedesktop.org. Retrieved 21 May 2014. ^ Hutterer, Peter (8 October 2014). Consolidating the input stacks with libinput (Speech). The X.Org Developer Conference 2014. Bordeaux. Retrieved 18 April 2016. ^ "libinput: the road to 1.0". ^ "Libinput support added to Touchpad KCM". ^ "Libinput now enabled as default xorg driver for F-22 workstation installs". ^ a b Høgsberg, Kristian (20 May 2014). "Wayland and Weston 1.5.0 is released". wayland-devel mailing list. ^ Ådahl, Jonas (12 November 2013). "[RFC] Common input device library". Wayland mailing list. ^ Hutterer, Peter (24 September 2014). "libinput - a common input stack for Wayland compositors and X.Org drivers". Retrieved 17 April 2016. ^ de Goede, Hans (1 February 2015). "Replacing xorg input - Drivers with libinput" (PDF). Retrieved 18 April 2016. ^ a b Dodier-Lazaro, Steve; Peres, Martin (9 October 2014). Security in Wayland-based Desktop Environments: Privileged Clients, Authorization, Authentication and Sandboxing! (Speech). The X.Org Developer Conference 2014. Bordeaux. Retrieved 18 April 2016. ^ "Wayland Live OS Is Now Based On Debian Testing, Working KDE Wayland Support". Phoronix. ^ "Trying Out Wayland With Rebecca Black". Phoronix. ^ "New Wayland Live CD Has A Lot Of Features". Phoronix. ^ "ReleaseNotes for Ubuntu 17.10". Canonical. ^ "Ubuntu 18.04 will revert to long-in-the-tooth Xorg". ^ "Bionic Beaver 18.04 LTS to use Xorg by default". Canonical. ^ Bassi, Emmanuele (31 January 2011). "ANNOUNCE: Clutter 1.6.0 (stable)". clutter-announce (Mailing list). ^ Bassi, Emmanuele (24 September 2013). "ANNOUNCE: Clutter 1.16.0 (stable)". clutter-announce (Mailing list). ^ "Wayland – Enlightenment". Archived from the original on 29 March 2013. Retrieved 6 March 2013. ^ "GTK+ Roadmap". Retrieved 8 March 2016. ^ Lantinga, Sam (8 March 2014). "SDL 2.0.2 RELEASED!". SDL Project. Retrieved 18 March 2014. ^ Larabel, Michael (9 January 2016). "SDL 2.0.4 Was Quietly Released Last Week With Wayland & Mir By Default". Phoronix.com. Retrieved 17 April 2016. ^ Berglund, Camilla (8 April 2014). "Implementation for Wayland · Issue #106 · glfw/glfw · GitHub". Retrieved 14 August 2014. ^ "FreeGLUT Wayland support merged". ^ "GNOME Initiatives - Wayland". GNOME Wiki. Retrieved 8 March 2016. ^ "KWin/Wayland". KDE Community Wiki. Retrieved 8 March 2016. ^ "Enlightenment - Wayland". Enlightenment.org. Retrieved 8 March 2016. ^ "Enlightenment DR 0.20.0 Release". Enlightenment.org. Retrieved 8 March 2016. ^ "The Enlightenment of Wayland". FOSDEM.org. Retrieved 8 March 2016. ^ "ReleasePlanning/FeaturesPlans". GNOME Project. Retrieved 31 May 2015. ^ "A Look At The Exciting Features/Improvements Of GNOME 3.22". Phoronix. ^ "Plasma's Road to Wayland". 25 July 2014. ^ Larabel, Michael (14 June 2013). "KDE 4.11 Beta Released, Works On Wayland". Phoronix.com. Retrieved 17 April 2016. ^ Graesslin, Martin (29 June 2015). "Four years later". Retrieved 17 April 2016. ^ Schaller, Christian (3 July 2014). "Wayland in Fedora Update". blogs.gnome.org. Retrieved 17 April 2016. ^ "VNC® Wayland Developer Preview". 8 July 2014. Archived from the original on 14 July 2014. ^ "RealVNC Wayland developer preview email". freedesktop.org. 9 July 2014. ^ "Maliit Status Update". Posterous. 2 April 2013. Archived from the original on 17 May 2013. Retrieved 14 October 2013. ^ "More Maliit Keyboard Improvements: QtQuick2". Murray's Blog. 2 April 2013. Retrieved 14 October 2013. ^ "Maliit under Wayland". Archived from the original on 11 June 2013. Retrieved 14 September 2013. ^ "wlterm". Freedesktop.org. Retrieved 8 July 2014. ^ a b Hillesley, Richard (13 February 2012). "Wayland – Beyond X". The H Open. Heise Media UK. p. 3. ^ "Eclipse now runs on Wayland". 18 August 2014. ^ Stone, Daniel (16 February 2016). "Vulkan 1.0 specification released with day-one support for Wayland". ^ "Wayland Backend DRM | IVI Layer Management". GENIVI Alliance. Archived from the original on 1 February 2014. Retrieved 15 July 2013. ^ "Raspberry Pi Case Study". Collabora. Retrieved 9 August 2013. ^ "Wayland preview". Raspberry Pi. Retrieved 9 August 2013. ^ "The First Jolla Smartphone Runs With Wayland". LinuxG.net. 14 July 2013. Retrieved 8 October 2013. ^ VDVsx [@VDVsx] (13 July 2013). "#sailfishos main components diagram. #Qt5 #Wayland #JollaHQ #Akademy" (Tweet) – via Twitter. ^ Jolla [@JollaHQ] (13 July 2013). "@faenil @PeppeLaKappa @VDVsx our first Jolla will ship with wayland, yes" (Tweet) – via Twitter. ^ "IVI/IVI Setup". Tizen Wiki. Retrieved 8 April 2013. ^ VanCutsem, Geoffroy (10 July 2013). "[IVI] Tizen IVI 3.0-M1 released". IVI (Mailing list). ^ Amadeo, Ron. "The Samsung Z4 is Tizen's new flagship smartphone". Ars Technica. Retrieved 13 May 2017. ^ Høgsberg, Kristian (3 November 2008). "Premature publicity is better than no publicity". Retrieved 6 April 2016. ^ "Interview: Kristian Høgsberg". FOSDEM Archive. 29 January 2012. Retrieved 8 March 2016. ^ a b Hillesley, Richard (13 February 2012). "Wayland - Beyond X". The H Open. Heise Media UK. Retrieved 8 March 2016. ^ Høgsberg, Kristian. "Wayland – A New Display Server for Linux". Linux Plumbers Conference, 2009. ^ Jenkins, Evan (22 March 2011). 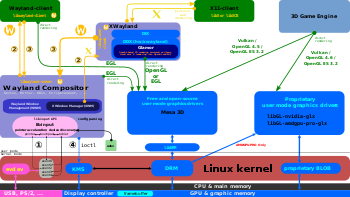 "The Linux graphics stack from X to Wayland". Ars Technica. Retrieved 17 April 2016. ^ Larabel, Michael (29 October 2010). "Wayland Becomes A FreeDesktop.org Project". Phoronix.com. Retrieved 17 April 2016. ^ Høgsberg, Kristian (29 October 2010). "Moving to freedesktop.org". Retrieved 31 July 2013. ^ Høgsberg, Kristian (3 December 2008). "Wayland is now under MIT license". wayland-display-server (Mailing list). ^ Høgsberg, Kristian (22 November 2010). "Wayland license clarification". wayland-devel (Mailing list). ^ Høgsberg, Kristian (19 September 2011). "License update". wayland-devel (Mailing list). ^ Munk, Carsten (11 April 2013). 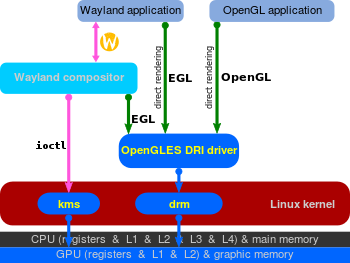 "Wayland utilizing Android GPU drivers on glibc based systems, Part 1". Mer Project. Retrieved 3 July 2013. ^ Munk, Carsten (8 June 2013). "Wayland utilizing Android GPU drivers on glibc based systems, Part 2". Mer Project. Retrieved 3 July 2013. ^ Larabel, Michael (11 April 2013). "Jolla Brings Wayland Atop Android GPU Drivers". Phoronix.com. Retrieved 17 April 2016. ^ "Wayland". Wayland.freedesktop.org. Retrieved 15 July 2013. ^ Høgsberg, Kristian (9 February 2012). "[ANNOUNCE] Wayland and Weston 0.85.0 released". wayland-devel mailing list. ^ Høgsberg, Kristian (24 July 2012). "Wayland and Weston 0.95.0 released". wayland-devel mailing list. ^ Høgsberg, Kristian (22 October 2012). "Wayland and Weston 1.0". wayland-devel mailing list. ^ Scherschel, Fabian (23 October 2012). "Wayland's 1.0 milestone fixes graphics protocol". The H Open. Heise Media UK. Retrieved 17 April 2016. ^ Larabel, Michael (16 April 2013). "Wayland 1.1 Officially Released With Weston 1.1". Phoronix.com. Retrieved 17 April 2016. ^ Høgsberg, Kristian (15 April 2013). "1.1 Released". wayland-devel mailing list. ^ Larabel, Michael (13 July 2013). "Wayland 1.2.0 Released, Joined By Weston Compositor". Phoronix.com. Retrieved 17 April 2016. ^ Høgsberg, Kristian (12 July 2013). "Wayland and Weston 1.2.0 released". wayland-devel mailing list. ^ Høgsberg, Kristian (11 October 2013). "Wayland and Weston 1.3 releases are out". wayland-devel mailing list. ^ Paalanen, Pekka (19 September 2014). "Wayland and Weston 1.6.0 released". wayland-devel mailing list. ^ Harrington, Bryce (14 February 2015). "[ANNOUNCE] wayland 1.7.0". wayland-devel mailing list. ^ Harrington, Bryce (14 February 2015). "[ANNOUNCE] weston 1.7.0". wayland-devel mailing list. ^ Harrington, Bryce (2 June 2015). "[ANNOUNCE] wayland 1.8.0". wayland-devel mailing list. ^ Harrington, Bryce (2 June 2015). "[ANNOUNCE] weston 1.8.0". wayland-devel mailing list. ^ Harrington, Bryce (21 September 2015). "[ANNOUNCE] wayland 1.9.0". wayland-devel (Mailing list). ^ Harrington, Bryce (21 September 2015). "[ANNOUNCE] weston 1.9.0". wayland-devel (Mailing list). ^ Harrington, Bryce (17 February 2016). "[ANNOUNCE] wayland 1.10.0". wayland-devel (Mailing list). ^ Harrington, Bryce (17 February 2016). "[ANNOUNCE] weston 1.10.0". wayland-devel (Mailing list). ^ Nestor, Marius (18 February 2016). "Wayland 1.10 Display Server Officially Released, Wayland 1.11 Arrives in May 2016". Softpedia. ^ Larabel, Michael (16 February 2016). "Wayland 1.10 Officially Released". Phoronix.com. Retrieved 17 April 2016. ^ Harrington, Bryce (1 June 2016). "[ANNOUNCE] wayland 1.11.0". wayland-devel (Mailing list). Retrieved 1 June 2016. ^ Harrington, Bryce (1 June 2016). "[ANNOUNCE] weston 1.11.0". wayland-devel (Mailing list). Retrieved 1 June 2016. ^ Harrington, Bryce (21 September 2016). "[ANNOUNCE] wayland 1.12.0". wayland-devel (Mailing list). Retrieved 21 September 2016. ^ Harrington, Bryce (21 September 2016). "[ANNOUNCE] weston 1.12.0". wayland-devel (Mailing list). Retrieved 21 September 2016. ^ Harrington, Bryce (21 February 2017). "[ANNOUNCE] wayland 1.13.0". wayland-devel (Mailing list). Retrieved 30 April 2017. ^ Harrington, Bryce (25 February 2017). "[ANNOUNCE] weston 2.0.0". wayland-devel (Mailing list). Retrieved 30 April 2017. ^ Harrington, Bryce (8 August 2017). "[ANNOUNCE] wayland 1.14.0". wayland-devel (Mailing list). Retrieved 25 March 2018. ^ Harrington, Bryce (8 August 2017). "[ANNOUNCE] weston 3.0.0". wayland-devel (Mailing list). Retrieved 25 March 2018. ^ Foreman, Derek (9 April 2018). "[ANNOUNCE] wayland 1.15.0". wayland-devel (Mailing list). Retrieved 15 April 2018. ^ Foreman, Derek (9 April 2018). "[ANNOUNCE] weston 4.0.0". wayland-devel (Mailing list). Retrieved 15 April 2018. ^ Foreman, Derek (24 August 2018). "[ANNOUNCE] wayland 1.16.0". wayland-devel (Mailing list). Retrieved 30 November 2018. ^ Foreman, Derek (24 August 2018). "[ANNOUNCE] weston 5.0.0". wayland-devel (Mailing list). Retrieved 30 November 2018. ^ "Wayland releases". Wayland. Retrieved 18 April 2019. Høgsberg, Kristian. "Wayland at FOSDEM 2012". Brockmeier, Joe 'Zonker' (17 November 2010). "The way to Wayland: Preparing for life After X". LWN. Hillesley, Richard (13 February 2012). "Wayland – Beyond X". The H.
Griffith, Eric (7 June 2013). "The Wayland Situation: Facts About X vs. Wayland". Phoronix. This page was last edited on 18 April 2019, at 14:57 (UTC).